This Diwali, along with the fire crackers and fun, the cinema lovers are in for a Bollywood treat, as they are going to witness a fiery battle at the box office as well. Eagerly awaited films Action Replayy and Golmaal 3 are slated to release coinciding Diwali - 5th November 2010. Inspired from a Gujarati play, Vipul Shah's Action Replayy is a sci-fi, romantic comedy. Lead actors action-man Akshay Kumar and mesmerizing Aishwarya Rai in their retro avatars are the film's biggest strength. But, that's not where it ends, as Action Replayy will have to share the cine-space with a tough competitor, Rohit Shetty's Golmaal 3, the first Bollywood trilogy ever. The first two parts of Golmaal have already been big hits. Thus the third part is surely a frontrunner for success at the ticket windows across the nation. The multi-starrer that stars Kareena Kapoor, Ajay Devgn, Tusshar Kapoor, Arshad Warsi and many others is going to tickle many a funny bone! Aishwarya or Kareena? A sci-fi rom-com with a retro feel or an out-and-out laughter riot? What is going to be the audiences' pick? Ganesha finds out with the help of Vedic Astrology. Rahu is placed in the Ascendant of the release time chart. Ketu is in 11th House with retrograde Venus and debilitated Moon. Lord of Bhagya Bhuvan is debilitated in the 11th House, but gives exalted aspect to the 5th House of performance. Golmaal 3's numerological total as per Pythagorean Numerology is 1, while Action Replayy's numerological total as per Pythagorean Numerology is 2. As Golmaal 3 and Action Replayy, both are releasing on same date and at the same time, both the films will be competing with each other during Diwali. 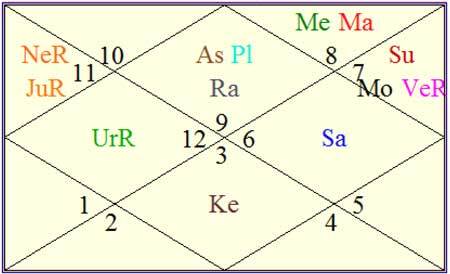 Astrologically speaking, Ketu's presence in the 7th House is also indicative of the same. As the Lord of the 7th House is in the 12th House with strong Mars, both the films are likely to do well abroad. Considering the numerological aspects, it is evident that Golmaal 3 will top the box office during Diwali, and will surpass all other movies. The reason is that the total of this film's title (spelling) is 1 ÃÂ 'Numero Uno'. Action Replayy's total is 2. So, even a layman, who does not know numerology would be able to make out that Golmaal will be number one and Action Replayy will be at number 2! Logic is correct in this case. Number 1 is ruled by Sun and number 2 is ruled by Moon. Sun governs fame and Moon governs emotions and nurturing. Ganesha feels that Golmaal may not be an extra-ordinarily creative movie compared to Action Replayy; however, Golmaal 3 would top the box office collections because of its numerological total. Golmaal 3 might receive a grand opening, while relatively speaking Action Replayy's opening business is likely to be lesser. Yet, Action Replayy will run in odd shows for longer a time than Golmaal 3, feels Ganesha. In a nut shell, Ganesha identifies Golmaal 3 as the winning horse of this race. Good luck and may Lord Ganesha bless cast and crew of both these films.